Mumbai: The Reserve Bank of India (RBI) seems to have ruled out relaxations in its new bad loan rules. RBI deputy governor N.S. 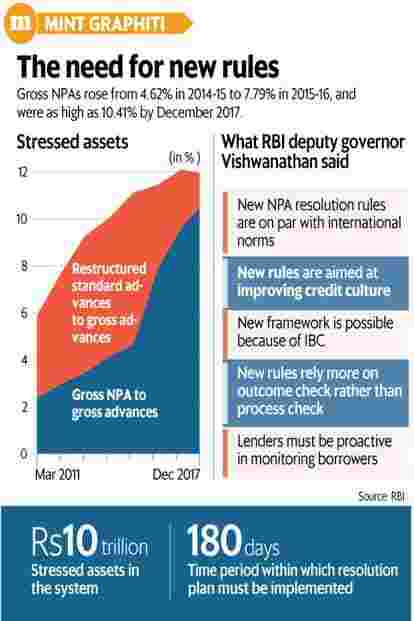 Vishwanathan defended the rules announced in February, saying that they were aimed at improving credit culture and nudging lenders to be proactive in tackling early signs of stress. The new bad loan rules stipulate that starting 1 March, lenders must implement a resolution plan within 180 days for loan accounts of at least Rs2,000 crore, failing which the defaulting borrowers must be referred to insolvency courts. They also mandate banks to report defaults weekly to RBI, even if loan payments are delayed by a day. The new framework, which had replaced earlier schemes such as strategic debt restructuring (SDR), 5/25 refinancing and Scheme for Sustainable Structuring of Stressed Assets (S4A), was seen as too harsh by bankers and some analysts. They have lobbied for extending the time period for resolution and also asked for a relaxation on the one-day default clause. But the demands have cut no ice with the central bank. “The Reserve Bank believes that a focused framework for resolution of distressed borrowers which respects and enforces the sanctity of the debt contract is required to make sure that the excesses observed during the last credit cycle are not repeated and we don’t end up in a similar situation a few years down the line," Vishwanathan said in a speech to graduates of National Institute of Bank Management in Pune. The new framework aims to reduce the arbitrage enjoyed by borrowers in taking loans from banks compared with raising funds from markets. Even a single day’s default on a bond would prompt markets to penalize the borrower heavily, said Vishwanathan. Indian banks are sitting on a stressed assets pool of over Rs10 trillion, of which gross non-performing assets (NPAs) are Rs8.86 trillion. According to Vishwanathan, timely intervention should be second nature to a bank. He said the insolvency and bankruptcy code provided a time-bound legal framework for dealing with stressed assets. “It does put pressure on the banking system but in the long term, we will see loan underwriting standards getting better as well as higher recovery," said Karthik Srinivasan, group head of financial sector ratings at Icra. He said stressed asset recognition gained pace after RBI’s asset quality review in late 2015 where several loans, which were then considered standard by banks, were classified as bad loans. Gross NPAs went up from 4.62% in 2014-15 to 7.79% in 2015-16, and were as high as 10.41% by December 2017. “This is why we have a history of a large number of cases of failed restructuring as the schemes were used for avoiding a downgrade rather than resolving the asset. Prolonging the true asset quality recognition suited both the bankers and the borrower," said Vishwanathan. Vishwanathan said concerns over the one-day default clause are not well-founded. He said lenders must ensure that loan repayment schedules are customized as per the cash flow of borrowers and they must insist that the borrower also keep adequate buffers to face such cash flow volatility. “If borrowers fail to pay on the due date because of a cash flow problem, banks should see that as an early warning indicator warranting immediate action. If borrowers with ability to pay on the due date delay it routinely or because they see other arbitrage options, that must change too. Bankers should warn their customers that one-day default will lead to their being on watch for resolution. Borrowers, too, should realize that they have to meet payment obligations as per the contract and it is no more sufficient to pay up only by 60-90 days past due date," he said. In his speech, Vishwanathan also cautioned about the “herd movement among bankers" to grow retail credit and the personal loan segment. “This is not a risk-free segment and banks should not see it as the grand panacea for their problem-riddled corporate loan book. There are risks here too that should be properly assessed, priced and mitigated," he said.